By Matthew Heck / March 11, 2019, 12:02 p.m.
Spain is facing a renewed crisis after Prime Minister Pedro Sanchez failed to pass a budget for 2019. Without an approved 2019 budget, per the Spanish constitution, the 2018 budget will continue throughout the next year (Article 134.14). Sanchez has agreed to hold snap elections on April 28. Sanchez likely allowed this as the 2018 budget was approved under the opposing coalition, and his party winning seats would break the impasse that has ensnared the government. This budgetary crisis comes after the Catalan independence referendum dispute, which has been a source of constant pressure on Madrid from both the left and right. Right-wing Spanish parties have accused Sanchez of treason for conceding to the demands of Catalan independence parties, while these left-wing Catalan parties are claiming suppression of their democratic rights. Sanchez’s choice to court Catalan independence—likely the only way for his party to hold power—has potentially forced his party into an unfavorable election. Political organization in Spain can get a bit wonky for people unfamiliar with it, so here is a quick run down to get you up to speed. Spain is a constitutional monarchy with a king (Philip VI). The primary executive is the president, who functions like the prime minister does in the British system. I will refer to the position as prime minister as there are other “presidents” in Spain. The legislature is comprised of two bodies, the Congress of Deputies and the Senate, though when counting seats, they are usually treated as a combined body. Autonomous Communities are roughly equivalent to states in the United States and the “presidents” of the Autonomous Communities are similar to state governors. Catalonia is special amongst the Autonomous Communities in that it is the most independent of the central government; it has its own police force under the command of the Catalan legislature. Currently, there are four large parties in Spanish politics. The most right-wing is the Popular Party (el Partido Popular or PP), followed by the center-right Citizens (Ciudadanos or C’s),the left-wing Socialist Party (el Partido Socialista Obrero Español or PSOE, Sanchez’s party, and finally the most left-leaning, “United We Can” (Unidos Podemos or Podemos). The PP and PSOE are the oldest and most entrenched parties in Spain, having fought for control of the government for decades. Ciudadanos and Podemos, on the other hand, are comparatively young and rose to prominence after the 2008 economic crash, which hit Spain particularly hard. Podemos was founded in 2014 and nearly overturned Spanish politics when it became the second largest party in 2015. Since then, Podemos has fallen back to being the third largest party. Other political players include the right-wing Vox party and various parties in favor of Catalan independence. Since parliament is split into four large blocks of comparable sizes, small parties have a lot of power. By joining coalitions, they control each bloc’s ability to cross the majority threshold needed to legislate. Sizeable independence parties also exist from Aragon, the Basque Country, Galicia, and the Canary Islands, along with minor movements in nearly every coastal region. Spanish leaders are hesitant to make concessions to any one group’s desires due to the precedent that could be set by such a course. Before the budget proposal failed, Sanchez had been relying on pro-Catalan parties to maintain his majority, after ousting former Prime Minister Mariano Rajoy (PP) from power. Rajoy was prime minister during the Catalan independence referendum, the ramifications of which now threaten Sanchez’s seat. Rajoy, however, was removed in a vote of no confidence last summer for corruption. Sanchez was then voted into office despite being part of a minority coalition. As a result, Sanchez’s PSOE holds only eighty-nine of the 350 seats in the legislature, whereas the PP has 119. This disparity has made Sanchez’s control shaky at best and forced him to rely on small, regional parties to hit a majority to pass legislations. As a result, Sanchez’s position grew increasingly complicated. His partnership with Catalan leaders in return for their political backing has forced him to choose between courting Catalan independence or loss of his position. This conflict of interest came to light when sedition trials began in Madrid for twelve Catalan leaders who had remained in Spain. As a result of the trials, Catalan parties decided to abandon their support of Sanchez before the 2019 budget vote, resulting in the failure of the bill. Looking ahead to the upcoming elections, Sanchez could have difficulty maintaining his current position as prime minister. Both the PSOE and PP have lost a drastic number of seats in the Spanish legislature, as Podemos and Ciudadanos have become more prominent in the past decade. The PSOE has relied on Podemos for support for their current government, but Podemos has since faced moderate and regular decline in their share of seats since their peak in 2015 as the second largest party. The large protests in Madrid and Barcelona that have taken place in the past few weeks are another indication of Sanchez’s declining support. In Madrid, thousands gathered in the Plaza de Colón to demand Sanchez resign as Prime Minister for holding talks with separatist leaders. In response, union and pro-independence leaders organized a general strike in Barcelona to show support for the twelve Catalan leaders on trial. Since the failure of the referendum, the direct rule from Madrid for nearly a year, and the new elections, separatist groups have seen a stark decline in power. Ciudadanos has taken the place of Together for Catalonia (Junts per Catalunya) and Republican Left of Catalonia as the major party following the most recent Autonomous Community elections. Albert Rivera, Ciudadanos’ founder and leader, is himself from Catalonia, yet openly opposes independence. The crackdown by Madrid on independence has severely reduced morale in Barcelona, allowing Ciudadanos to take the place regional independence parties once held in Catalan politics. Ciudadanos will likely try to leverage their new popularity on a national level to gain seats in the legislature. 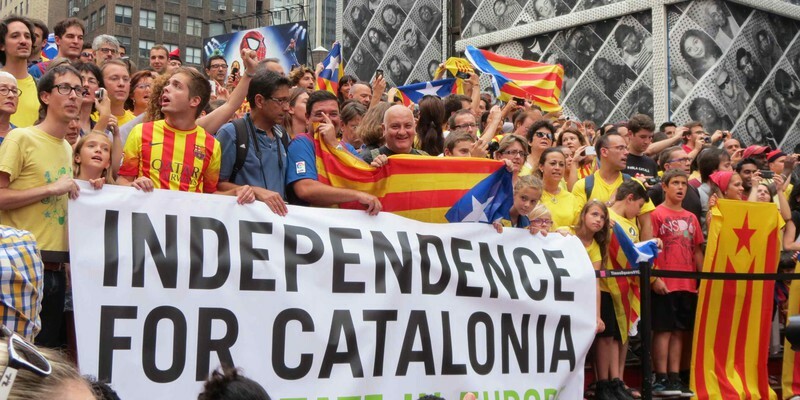 Despite claiming victory in the referendum, top independence leaders were hesitant to declare independence and many fled the country, despite widespread support in Catalonia. The independence movement came to an abrupt halt despite the referendum and international sentiment appearing in their favor. The recalcitrant actions by independence leaders suggest a lack of commitment to the independence cause, by which they had previously defined themselves. This change will make it harder to achieve future electoral success. Other signs of potential trouble for Sanchez come from recent elections in Autonomous Communities. Last month in Andalusia, the most recent Community to hold elections and Spain’s most populous region, a right-wing government won a majority in the legislature. The office of the Andalusian presidency was seized by the PP after thirty-seven years of continuous PSOE occupation. Vox also won more seats than expected in Andalusia, taking twelve seats when it was predicted to win five seats in a house of 109. Vox has gained attention in Spain for its hard anti-immigration, but pro-EU, stance. Vox further drew attention as this was their first Community elections as a party. Despite being integral to pushing the PP coalition across the majority threshold, PP managed to keep Vox out of important executive positions in Andalucia. In a reflection of the national government under Rajoy, Ciudadanos joined PP in a coalition in Andalucia. Overall trends suggest that Sanchez will likely be facing a difficult election to stay in power. By allying with Catalan parties in the short term, he has potentially increased support for competing parties. Further, Ciudadanos has seen steady increases in support in the wealthy Catalonia while right-wing parties in general have seen a surge in support in the traditional PSOE bastion of Andalusia. This election will likely show if Sanchez’s ascension to power was a one-off due to a poor decision of his political opponent or a shift in political power that could be sustained in the future. Even if the PSOE were to lose seats in the upcoming elections in late April, the four-way split in votes could prevent the formation of a majority by either side. Matthew Heck is a Staff Writer for The Gate. The image featured in this article is licensed under the Creative Commons Attribution-Share Alike 2.0 Generic License. The original was taken by Liz Castro and can be found here.